Stimulating drinks made from exotic plants, like the cocoa tree and a type of southern holly, were consumed much more widely across the prehistoric Southwest than was thought, according to new research. 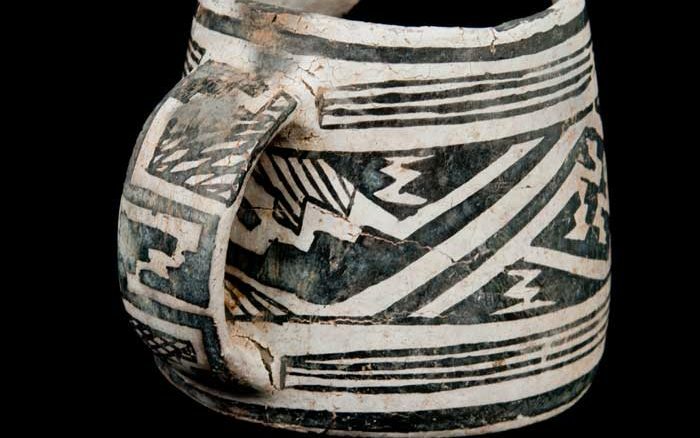 A recent study — the largest of its kind ever conducted — analyzed nearly 200 samples of pottery from Southwestern archaeological sites, ranging from Colorado to Chihuahua and spanning 650 years of human occupation. This is the first evidence that the Ancestral Puebloans and other Southwestern cultures consumed the highly caffeinated Ilex drinks. The results revealed that more than 20 percent of the ceramics contained traces of either cocoa or a potent concoction known as ‘black drink,’ made from yaupon holly, known to scientists as Ilex vomitoria. Crown was one of the researchers who, in 2009, first discovered traces of cocoa — or cacao — in pottery excavated from New Mexico’s Chaco Canyon. Following that find, Crown and colleague W. Jeffrey Hurst, senior scientist with the Hershey Company, wanted to learn how widespread the use of cocoa was throughout the pre-contact Southwest. “We were interested in determining the spatial and temporal extent of cacao use in the Southwest and Mexican Northwest,” she said. In all, the new study analyzed 177 pottery sherds from 18 different sites, ranging in age from the year 750 to 1400. They included monuments like Chaco’s Chetro Ketl, the ancient Hohokam settlement in Arizona known as Snaketown, and more recently studied sites like Windy Knob in southwestern Colorado. Using liquid chromatography and mass spectrometry, the researchers then analyzed the sherds for traces of chemicals known as methylxanthines — stimulants that include caffeine, theobromine and theophylline, which are found in cacao and Ilex vomitoria, though in different proportions. The results, Crown said, were surprising. “When we started getting results … we realized that not all of them were clearly cacao,” she said. “Many [of the results] had high caffeine [levels], which is not characteristic of cacao, and some had none of the other methylxanthines — theobromine and theophylline — that characterize cacao. “We fully expected to see evidence for cacao — or not — in the samples,” Crown added. In addition to showing that holly-based drinks were likely used in the pre-Hispanic Southwest, this new analysis reveals just how widespread the consumption of caffeine was in the region. 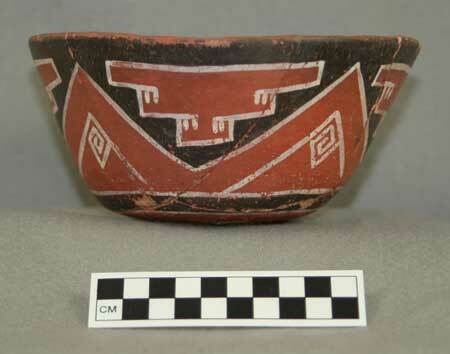 Of the 177 pottery samples — 40 of them, or 22 percent — turned up traces of either cacao or Ilex, even in the sherds from communities that were not known to have Mesoamerican artifacts, or other signs of influence from far-flung cultures. 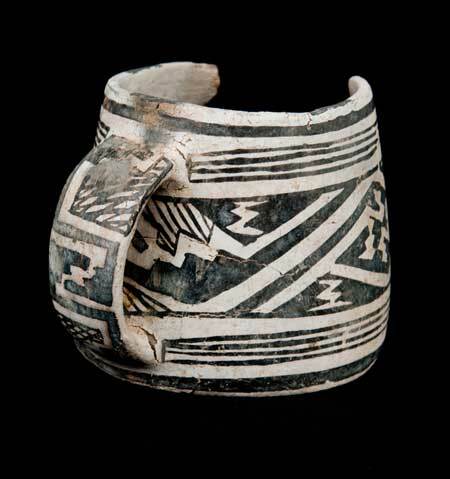 This, Crown noted, indicates that the Ancestral Puebloans, the Hohokam, and other Southwestern groups not only traded with the peoples of Mesoamerica and the Gulf Coast, they had prolonged and sustained contact with them. “Once made into drinks, these plants were consumed,” she said. “So, unlike some other exchanged items, if they were an important part of life in the Southwest, or Northwestern Mexico, there had to be an ongoing supply, even if they were consumed only sporadically. “This created social and economic relationships with distant populations,” she added. “Individuals who served these drinks might have created more local relationships and obligations with the people who drank them in feasts or rituals or political contexts. Crown and Hurst report their findings in the Proceedings of the National Academy of Sciences. If materials are being transported long distances by hand it makes sense to carry it in the most compact and efficient form possible. In this case the most compact form was as a block of bitter chocolate, which leaves very little behind except for a sticky residue on the cup. It is unlikely that any other portions of the plant would have been brought along, there wasn’t really any economic reason to do so and doubtful any symbolic or religious one.